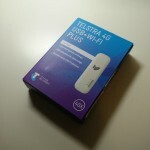 Telstra's network rules rural Australia - jxeeno™ blog. 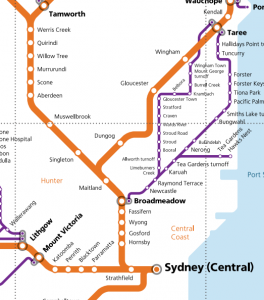 Telstra’s 3G/4G outperforms Optus along NSW’s regional railway route. Regional train trips used to be occupied by staring out into the vast NSW country side and marveling at the single-rail track first built over a century before. But in this day and age, I try to make good use of the 6 hours I spend on the XPT between Sydney and Taree. 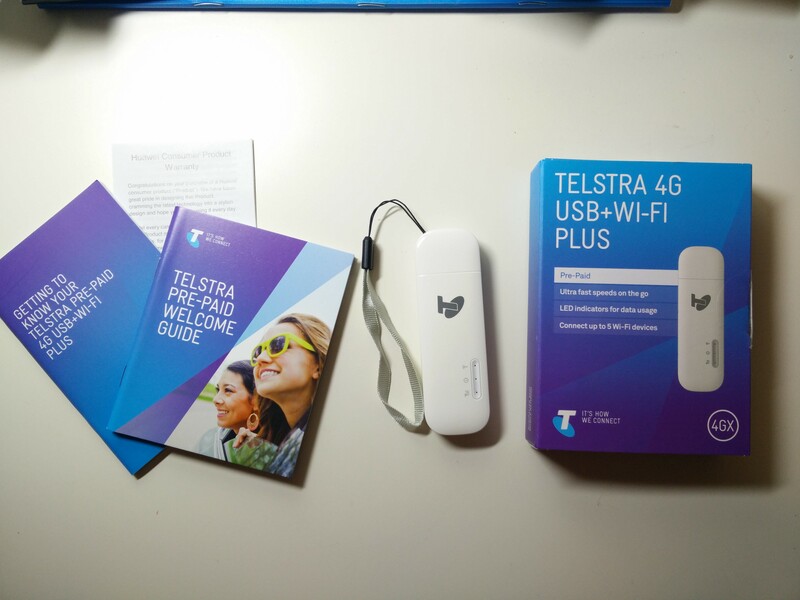 After spending a solid week and plus a train ride with the trusty Telstra 4G USB+Wi-Fi Plus dongle and my OnePlus One with a Vaya Mobile sim card running on the Optus network last week, I thought I’d share a few thoughts about my experience on both the Telstra and Optus network. Perhaps unsurprisingly, both Optus and Telstra have solid 4G coverage in metropolitan Sydney. In the first half hour as I travelled north through Central, Strathfield, Epping and Hornsby, both networks allowed me to do basic work – access my Google Documents and some development work without issues. But as the train journeyed past Hornsby, towards the Central Coast – the networks began to differentiate themselves. 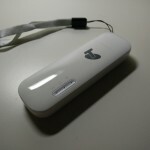 Optus’ signal began to drop in and out frequently, while for the most part, the network connection on the Telstra network was relatively stable. My phone struggled to get reception until we approached built-up areas along the Central Coast and Newcastle stretch, often defaulting to “Emergency Phone Calls Only”. Meanwhile, on the Telstra network, things continue to run smoothly. I even received an SMS saying I was passing one of Telstra’s new “4G only areas” where there is data only, and no voice services. 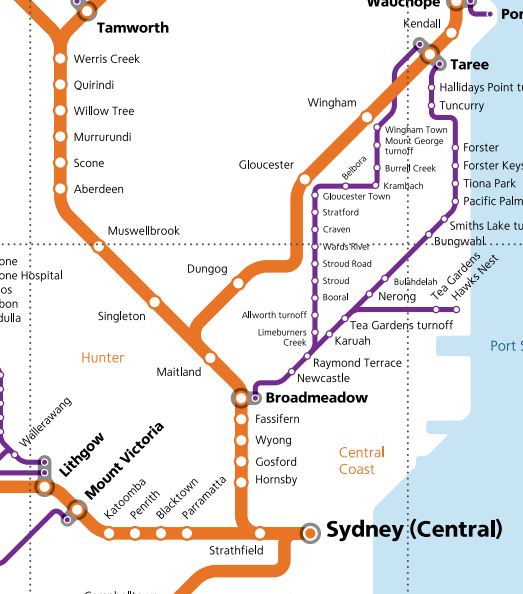 Map showing (roughly) parts of TrainLink’s North Coast Line (orange). However, once we passed Maitland and headed north-west towards Dungog, both network started to struggle. To put some of this into context, for those unfamiliar with the train journey from Sydney to Taree, the train travels inland a fair bit. It’s no surprise that coverage struggled in some of these areas – not only was there very low population density in some of these areas… but the train tracks were often installed in trenches that were dug out of the rocky and hilly terrain. For a lot of the journey, we would have been below the line of sight of most towers even if there were any. However, I was not dismayed – I continued my experiment! 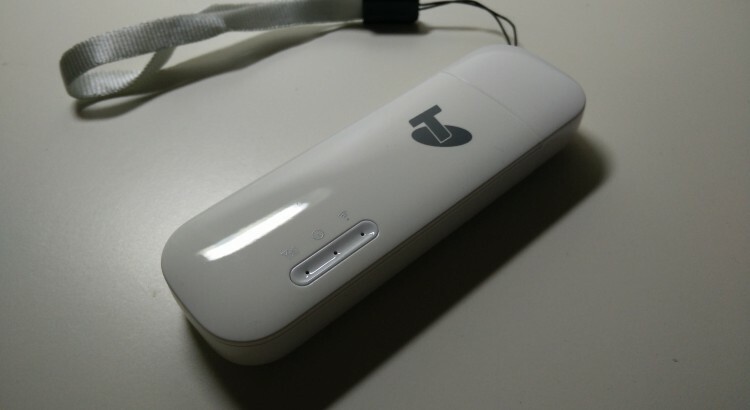 I found that the Telstra dongle managed to pick up the occasional 3G and even 4G signal as we approached nearby towns or passed a tall mountain in the distance with a reception tower… while the Optus phone: well, let’s just say there wasn’t much to report on. Even as the train was approaching the major settlements of Wingham and Taree, my Optus phone got a bar of “E” at best – just enough to send an SMS. I suspect the trees and foliage had a major factor in dampening the Optus network signals which has relatively lower transmission signal compared with Telstra’s NextG. 4G in Taree, 4GX in Forster-Tuncurry! 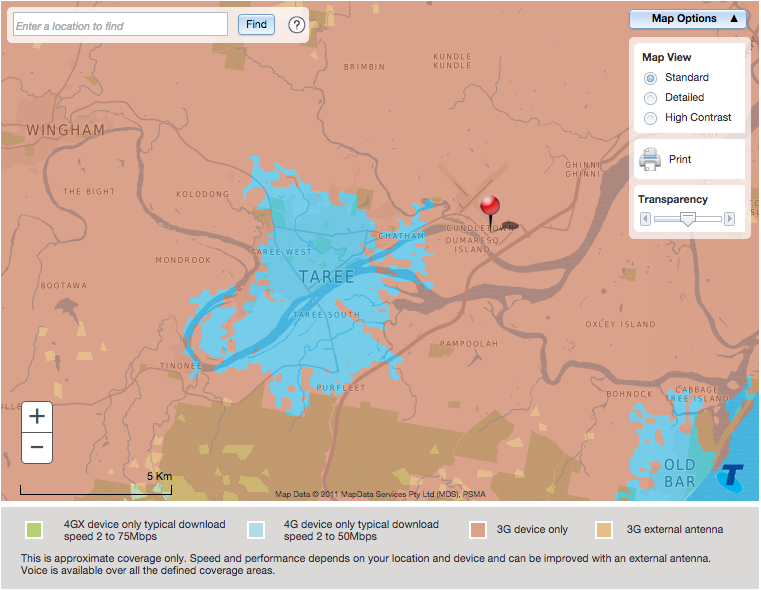 Unlike Optus who still hasn’t upgraded their mobile networks around Taree, Telstra has 4G coverage in the majority of the built-up area around Taree. 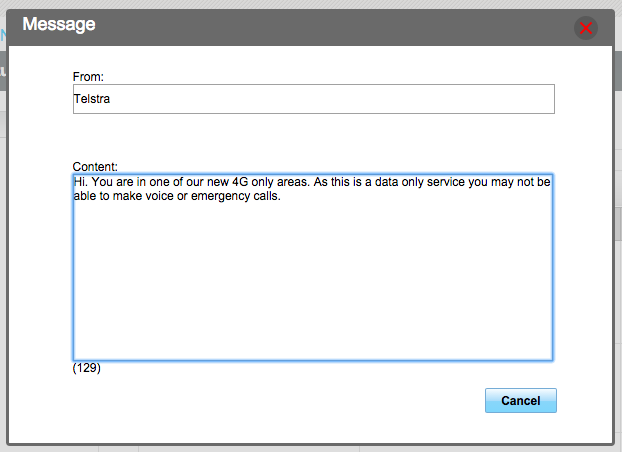 Their 4G coverage even extended further east than what their coverage website indicates. Whereas I’d sometimes struggle to load my emails or even load Google News on my Optus phone in surrounding towns of Taree, I found that I was able to consistently load pages without an issue. It was really nice to see! Overall, I’m thoroughly impressed with Telstra’s coverage and network speed in and around Taree. 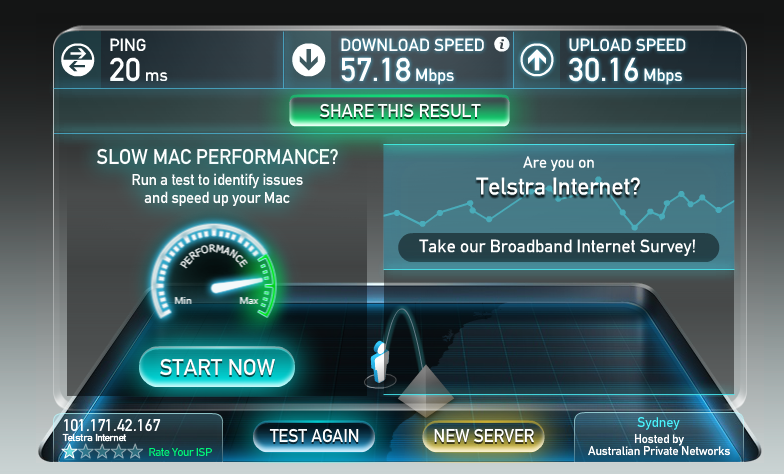 If I still lived there, I would be seriously contemplating a switch from Optus to Telstra’s network right about now. 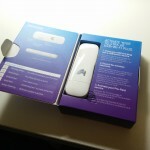 It’s something I’m going to consider when I finally decide to get a new phone, for the convenience when I’m back home. 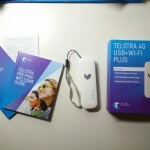 While both Optus and Telstra’s network struggled in parts of the train trip from Sydney to Taree, Telstra’s network was clearly in front in terms of coverage. It had solid coverage between the Central to Newcastle segment, and an admirable effort in the really sparsely populated areas between the settlements of Maitland, Dungog, Gloucester and Wingham. But where I thought Telstra’s network really shone was the coverage as we approached rural towns. Approaching Wingham and Taree, Telstra’s network “just worked” while Optus’ required quite a bit of arm flailing even to get “one bar” of 2G signal. Optus still has a fair bit to catch up in regional Australia – and with no successful bids in the first iteration of the Federal Government’s Regional Blackspots Program, I see that it will be hard for them to catch up with Telstra. As for Vodafone? I didn’t get to test them this time around, but I’m definitely planning a future comparison between Telstra and Vodafone for my next train trip. From memory, I may have managed to get an occasional signal in the Wondabyne area. I’ll give it a test run again next time I pass that area (probably in two weeks time).